What do Albuquerque, Austin, Grand Rapids, Louisville, and Philadelphia have in common? They are a part of Racial Equity Here, an initiative designed to dismantle institutional racism, eliminate racial inequities and improve outcomes for all. Despite differences in size, demographics, region, history and politics, these five cities, like cities across the country, have seen racial inequities across all indicators for success. From infant mortality to life expectancy, and everything between birth and death, one’s race predicts how well you will do. Racial Equity Here is a part of a national movement of local government leaders — in partnership with those most impacted by racial inequities — who are working to transform government to advance racial equity, to create a public sector that truly is for the public good. As part of The Government Alliance on Race and Equity (GARE) network, these five cities have access to technical support, tools and effective practices to break down practices that perpetuate racial gaps. Through tools, resources, communications and evaluation support, and training to analyze how routine operations impact racial equity, Racial Equity Here hopes to accelerate the process of operationalizing racial equity in local governments. Each city is developing an outcome-driven Racial Equity Action Plan. 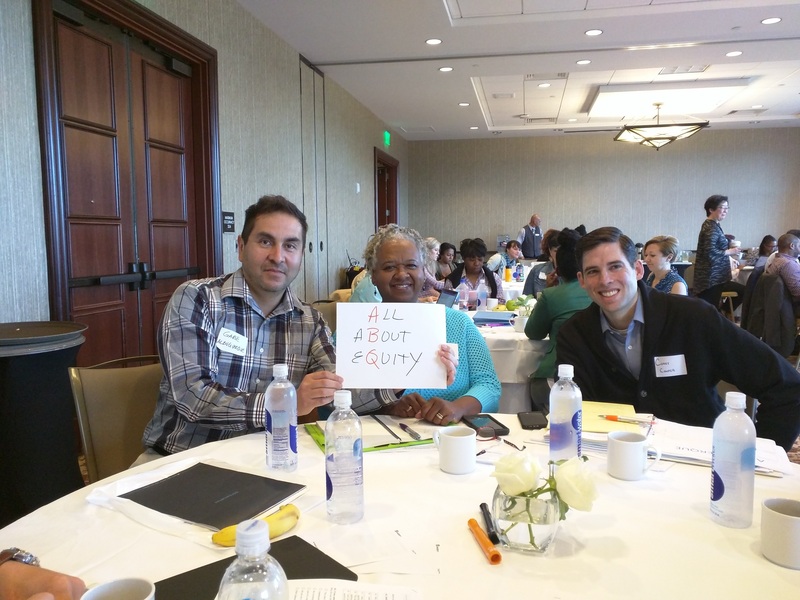 Beyond improving programs, Racial Equity Here transforms systems to shift the national dialogue around racial equity toward high, equitable outcomes for all. Albuqerque is working to embed racial equity with staff, city council and the public through resolutions and a publicly facing data dashboard of internal operations. Normalize: Use a shared racial equity framework and operate with urgency and accountability. Each city has created its racial equity vision and framework and is strengthening its internal infrastructure while also developing its Racial Equity Action Plan that prioritizes internal operations (workforce equity and/or contracting equity) and closing disparities for youth of color who are disproporationately disconnected from school and work. Louisville is building internal infrastructure to advance racial equity. Building Internal Infrastructure: Louisville, KY has started training its entire 6,000-person staff; and the newly created Chief Equity Officer and Chief Resilience Officer, along with the Director of the Center for Health Equity, form the Racial Equity Here leadership. 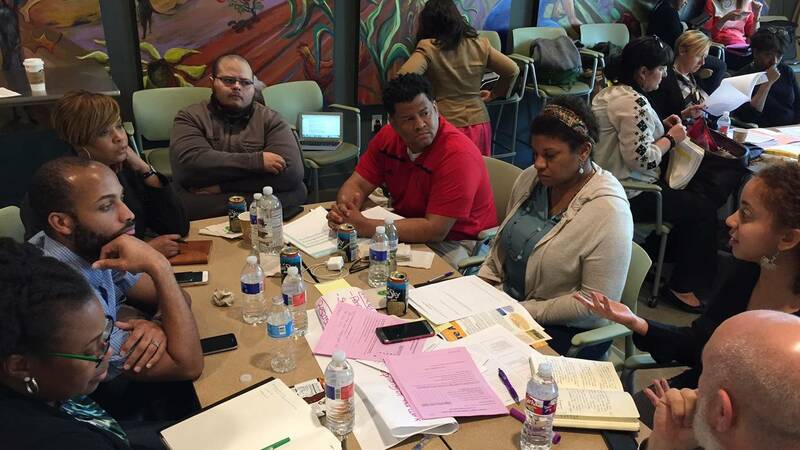 Building Community Partnerships: The new Chief Equity Officer in Austin, TX is building community ownership of this work by convening community stakeholders to co-create the city’s racial equity assessment tool which will be used for city decision-making. Making Strutural Change: Philadelphia, PA is partnering with local trade unions to diversity their membership through its $50M Rebuild project to renovate city-owned properties. The Power of Leadership: The Mayor of Grand Rapids, MI is passionately leading with a racial equity vision and the City Manager is aligned to operationalize it. Their strong leadership to remove barriers has already created the city’s most diverse recruits into the city’s policy academy. Strategic Planning to Organize: Albuquerque, NM is strategically planning for sustainability beyond the upcoming mayoral transition by working to embed racial equity with staff, city council and the public through resolutions and a publicly facing data dashboard of internal operations. Racial inequities are not natural; they have been created and maintained by governments and other institutions. Our systems and structures were designed to create current outcomes—racial inequities across all indicators for success. These costly, deeply racialized systems that are failing communities of color are actually failing all of us. For us to eliminate racial inequities and expand opportunities for all, we must take on institutional and structural racism. So many of the root causes of racial inequity—segregation, exclusion, concentrated poverty, and limited opportunities—are within the power of city government to change. Cities have always been laboratories for meaningful social and economic change. By understanding how municipal operations affect race and equity, city government can begin to transform systems to drive to better outcomes. 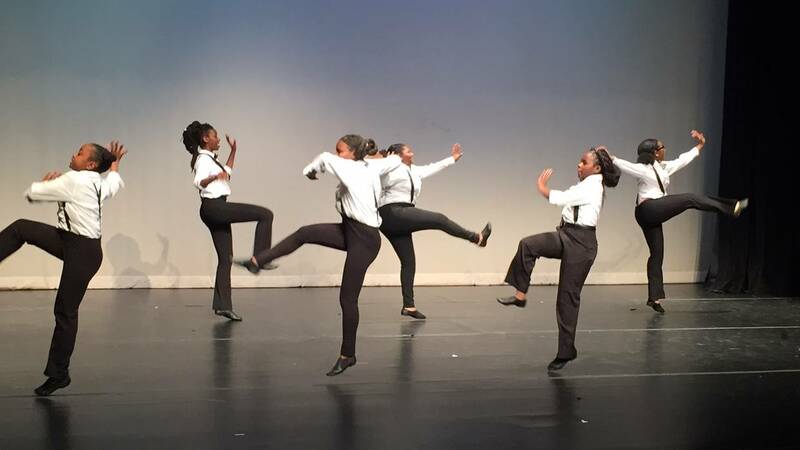 We recognize the importance and power of youth; we aim to create cities in which all youth are able to succeed. Structural racism has a profound impact on young people of color: it causes marked disparities in every part of their lives — school, work, housing, law enforcement. Yet despite the challenges, young people are creative, passionate and eager to build a more just future for themselves and their communities. 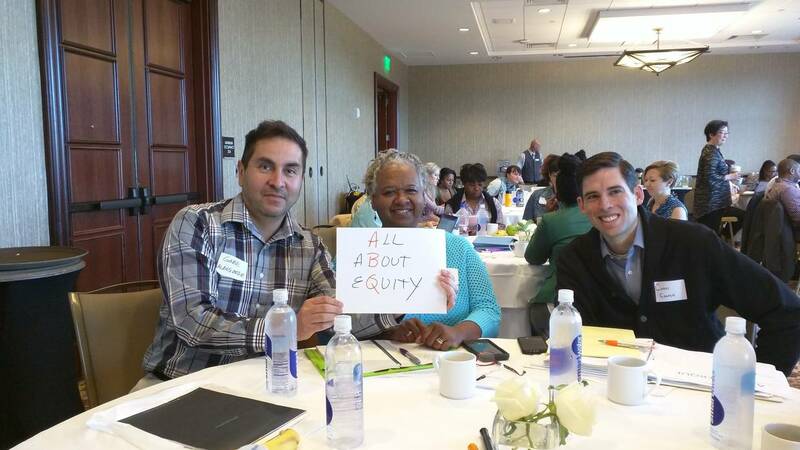 Racial Equity Here works with young people and community and agency partners to not just treat symptoms but dismantle root causes of inequity, eliminating disparities and improving outcomes for all young people. We are organizing in government with the belief that the transformation of government is essential for us to advance racial equity and is critical to our success as a nation. About GARE: Racial Equity Here builds on the work of GARE, a national network of government working to achieve racial equity and advance successful outcomes for all. We are are working with over 100 jurisdictions that are making a commitment to achieving racial equity, focusing on the power and influence of their own institutions, and working in partnership across sectors and with the community to maximize impact. The cities participating in Racial Equity Here will strengthen the evidence base around this work and blaze a trail for even more cities to follow suit. GARE is a joint project of is a project of Center for Social Inclusion and the Haas Institute for a Fair and Inclusive Society at UC Berkeley. What are you doing in your city to advance racial equity? Share your story here or email it to homar@livingcities.org! 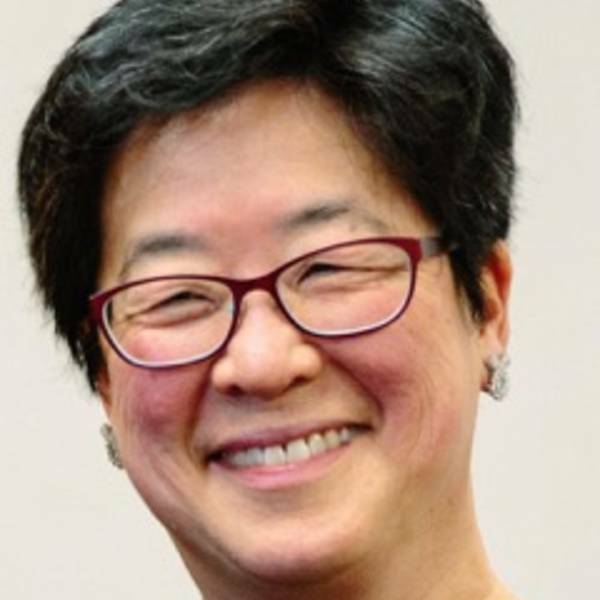 Nora Liu is the project manager for Racial Equity Here, a joint project of the Government Alliance on Race and Equity (GARE) and Living Cities, to support local governments leading the way to create a future for racial equity and economic growth for all.